It would be the second upgrade in six months from the agency which has traditionally talked Ireland down. 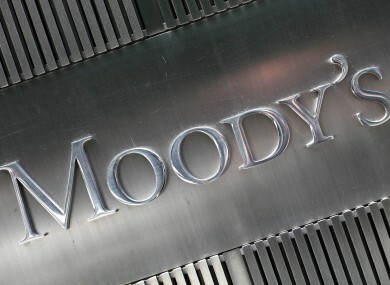 IRELAND LOOKS SET to receive its second upgrade from ratings agency Moody’s since the start of the year tomorrow. The ratings agency is likely to upgrade Irish debt to Baa2 from Baa3, which is still one notch below where other agencies such as Standard & Poors and Fitch rate our treasury bills. Danske Bank analyst Owen Callan said that he is predicting an upgrade, with the only slight risk being that Moody’s may be hesitant to give the country a second bump in less than six months. He said that Ireland’s underlying fundamentals – mainly the improving economic and industrial production data – would be enough to convince Moody’s to improve our debt rating. The continuing popularity of Irish government debt among investors is also a driver for Moody’s anticipated upgrade. The agency had been playing catch up with its competitors after going “too bearish” on the Eurozone in 2012, Callan said. Moody’s had been criticised for being slow to upgrade its rating of Irish government debt, which may have impacted negatively on Asian investors’ appetite for bonds in earlier auctions. The upgrade is seen as likely in many quarters, despite the head of the NTMA predicting last month that Irish debt ratings would remain where they are until after the budget. Callan said that he expects the ECB to take action to improve the flow of debt to SMEs in the eurozone next month. A cut in the overall interest rate, as well as the use of long term refinancing options to bring down the cost of borrowing for banks, have been suggested as possible policy tools for Frankfurt to use. The main impetus behind the action would be to free up credit for SMEs and try to stimulate a higher level of inflation in the eurozone. There is also a reasonable chance of the ECB pulling the trigger on a large scale quantitative easing programme, which Callan said could be up to €1 trillion. Elsewhere, the National Treasury Management sold €500 million in short term treasury bills earlier this morning at a yield of 0.22 per cent. Email “Here's why Moody's looks likely to upgrade Ireland tomorrow”. Feedback on “Here's why Moody's looks likely to upgrade Ireland tomorrow”.